Normally, when I go off roading or take long road trips, I'll strap two military Scepter fuel cans to the rear section of my roof rack. I have had zero issues with the cans leaking or getting damaged while being strapped to the roof rack, but I wanted a more efficient way to carry extra fuel. Some of the issues I had with caring the extra fuel on the roof was weight and how time consuming it was to mount or remove the fuel cans. Normally it would take about 15-20 minutes to get the fuel cans strapped down and run the security cable and lock. If I needed to use the fuel cans, it would take about 10 minutes to pull them off. Sometimes, I would press my luck and run on fumes because I did not feel like messing with the fuel cans. Pressing my luck worked well for me, except that one time, that one time sucked a lot. 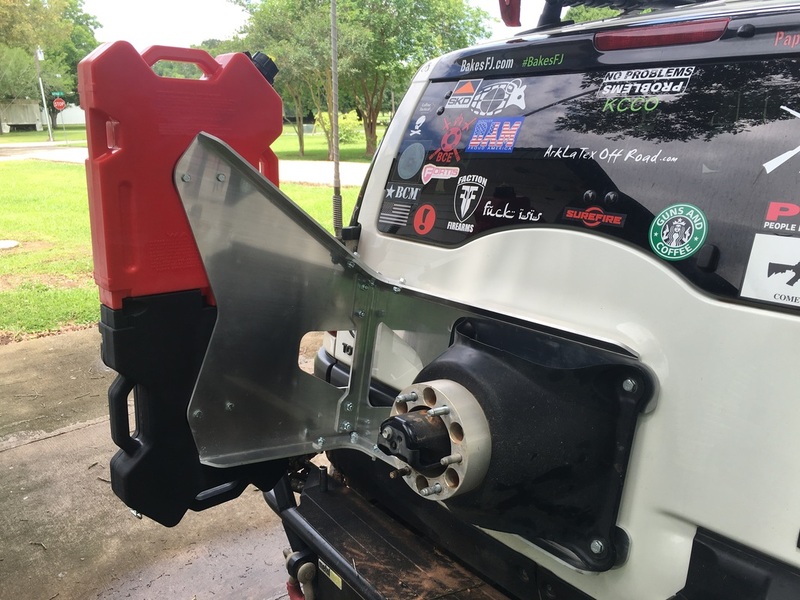 My solution for this was to eventually buy a rear swing out bumper that had a fuel can storage attachment mount. 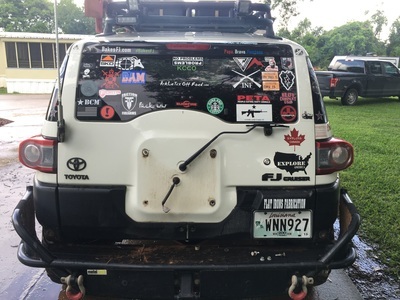 ​I already knew which rear swing out bumper I wanted (Metal Tech Red Eye) and had begun saving up for it. I was very excited to be part of the "swing out" club one day, but then I came across a game changing mod that would prevent me from getting my swing out. This mod that I speak of is Chitown4x4's Powered Rear Window Kit. This kit allows the rear window to be opened or closed (while stationary or moving) using a switch from inside the cab. 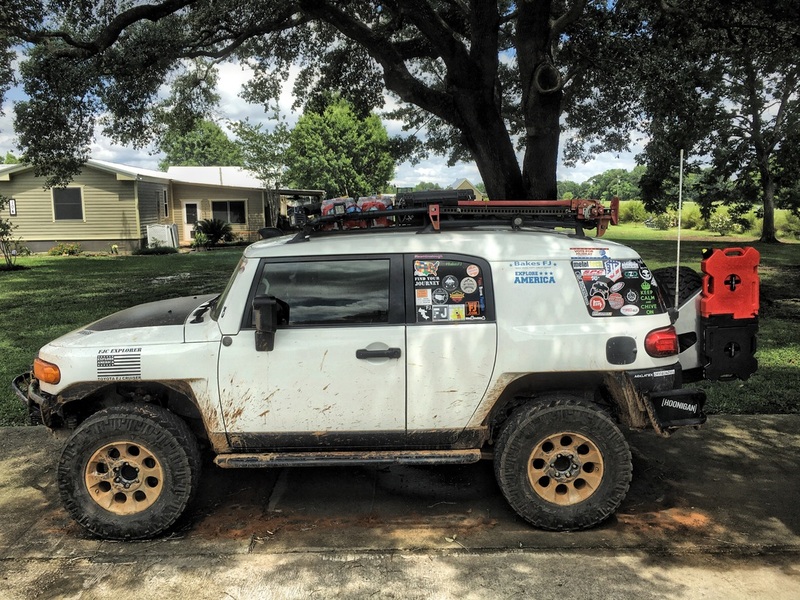 We all know how turbulent the air can be inside the FJ with just the front two windows down, but when the rear window is open, the air flow is much more smooth and peaceful. 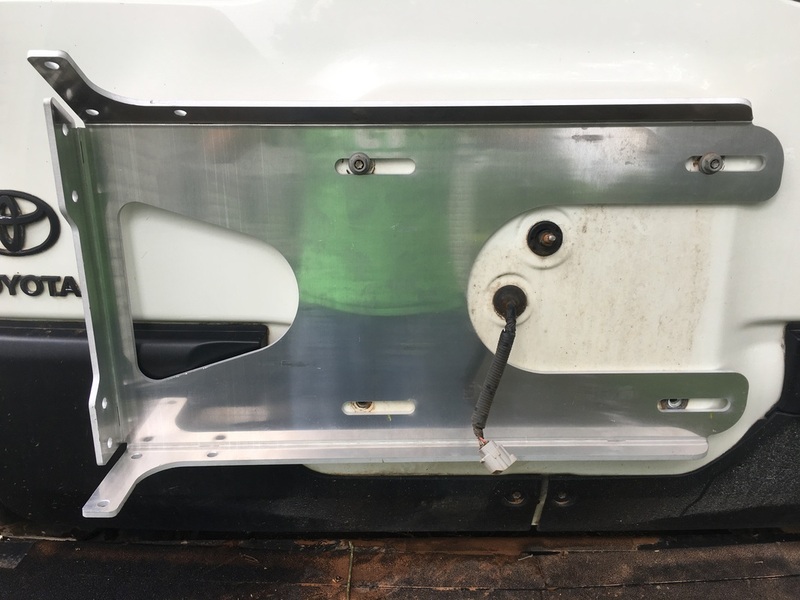 Once I installed the power window kit, I knew a swing out was no longer right for me. This is because most swing outs prevent the rear window from opening while the swing out arm is locked. 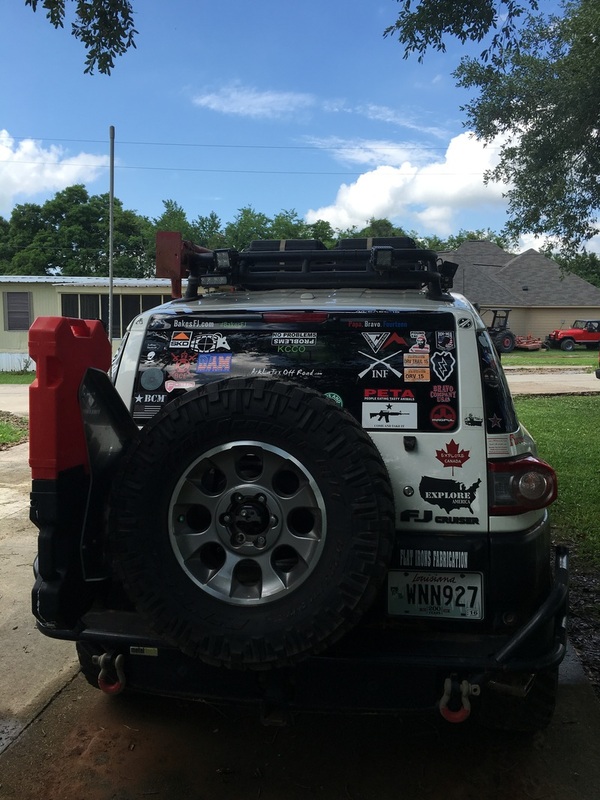 Losing the ability to open and ​close the rear window with the press of a button was not an option for me and I decided to continue carrying my extra fuel on the roof and keep my eyes open for another solution. At last another solution presented itself! 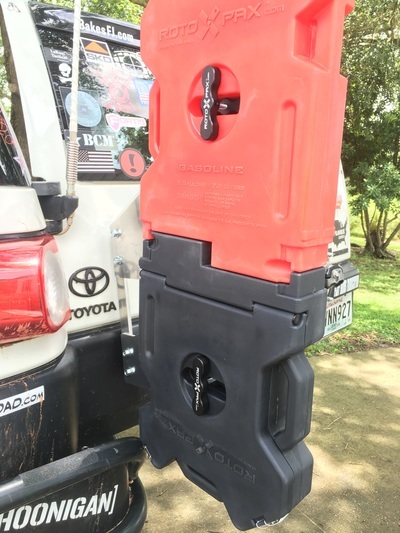 Chitown4x4 created the FJ PAX Mount, which allows for extra fuel, water or other variants of Rotopax containers to be carried on the rear door of the FJ. Best part about this kit, because Joe designed and created both the Powered Rear Window Kit and the FJ PAX Mount, they work together! Meaning, I can still open and close my rear window while carrying extra fuel on the rear. 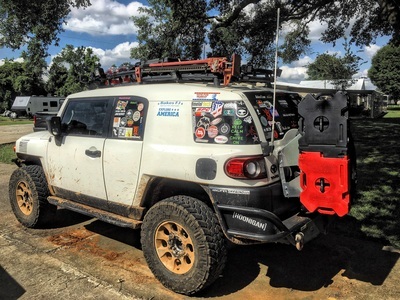 Just like the Powered Rear Window Kit, Joe did an amazing job designing the this set up. The FJ PAX Mount is made from two pieces of 1/4 thick 4000 series sheet aluminum that bolts together to make one sturdy mount. 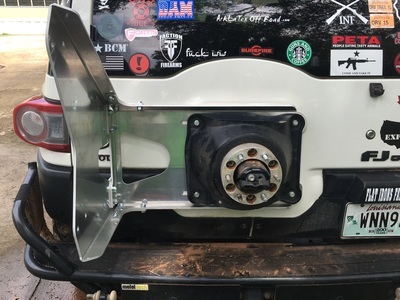 It is designed to be mounted behind the spare tire, between the door and spare tire mount. 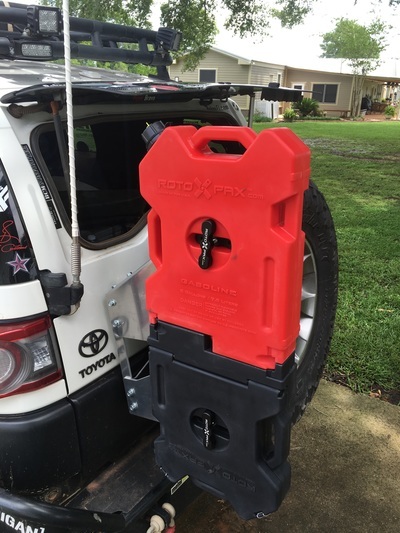 The FJ PAX Mount weighs approximately 15 pounds (without Rotopax). 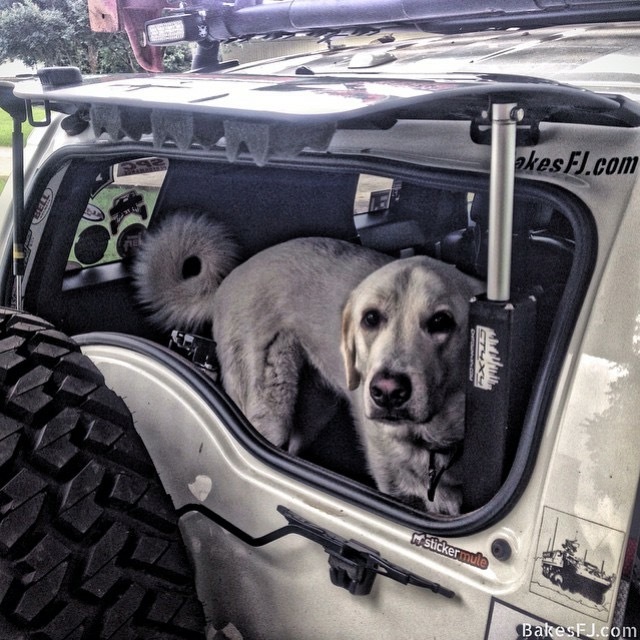 ​Once you purchase the FJ PAX Mount, you have a few options available. 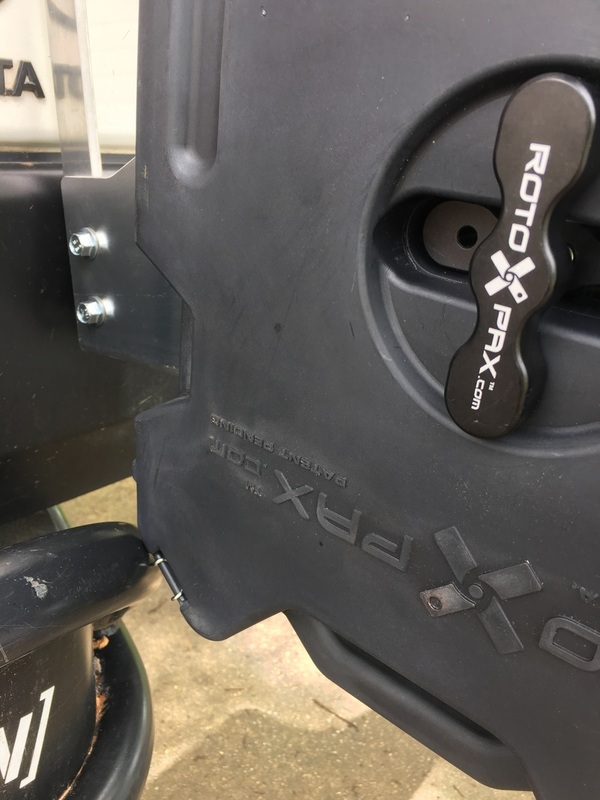 You can either buy the Rotopax mounts and cans from another distributor, or get them from Chitown4x4. My recommendation is to buy them through Chitown4x4. Reason being, Joe has put together several different package options which are available on their website. You can select the type of Rotopax mounts you want (locking mounts or non locking mounts) and the type and/or size of Rotopax containers you want. 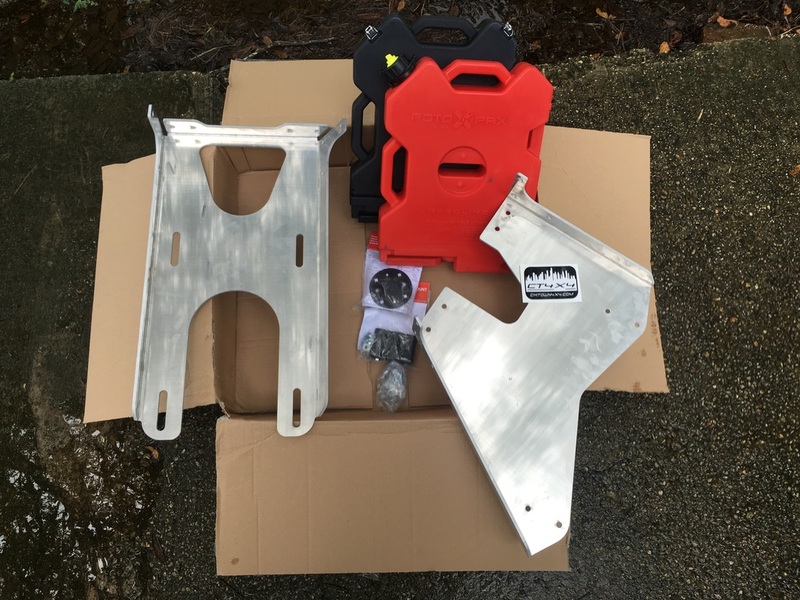 If you do not see a package which is right for your needs, contact Chitown4x4 and I know they will work with you and help you figure out what is right for you and your rig. 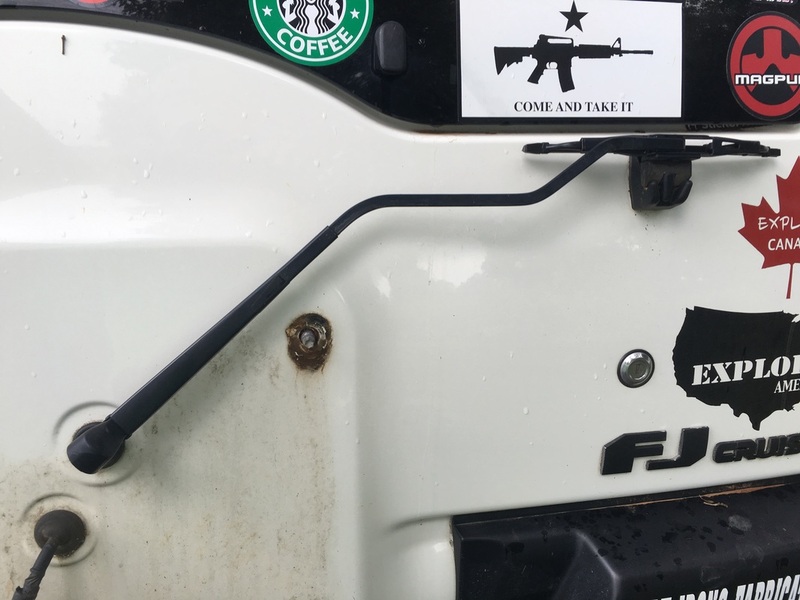 ​I have no problem spending money on a functional and useful modification or accessory. Having said that, I did some price comparisons on the interwebs and it looks like you save a little coin by selecting one of the Rotopax packages offered by Chitown4x4. I currently have the FJ PAX Mount with 2 gallon fuel can, 2 gallon storage can and non lockable mounts. 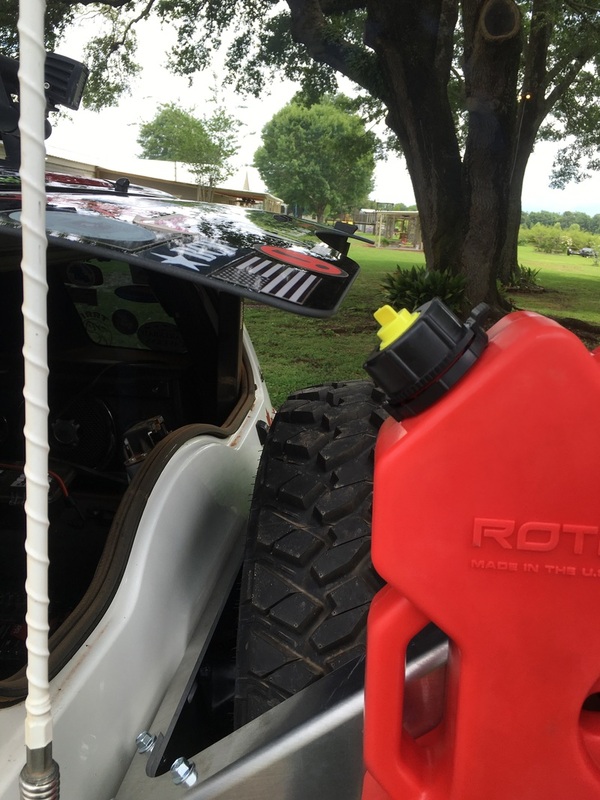 Since my needs chance depending on where I wheel, camp or the type of road trip, I'll purchase several more Rotopax cans (fuel and water) from Chitown4x4 and change my set up based on my adventure. 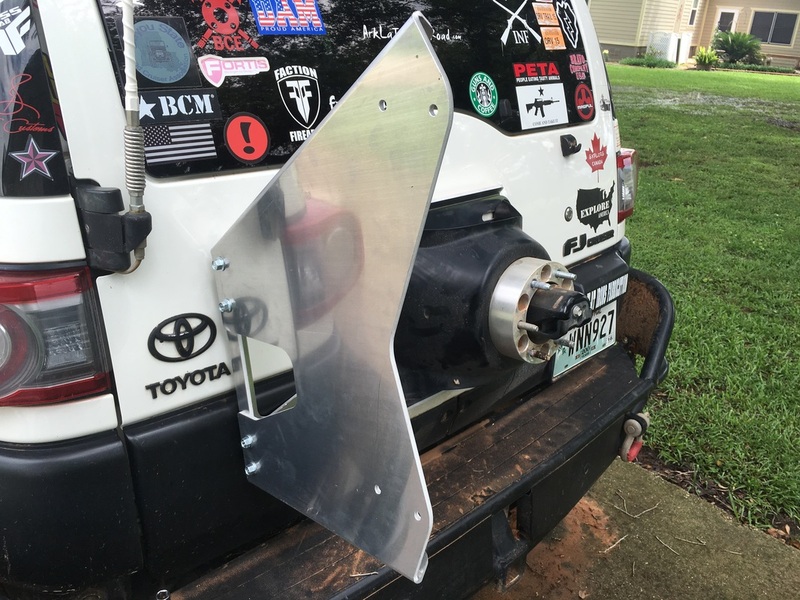 Great thing about this kit, is its very simple to mount on the FJ. From start to finish I would say installation took me about 3 hours. I could have done it faster, but I had several coffee breaks and had to run to the auto part store to get a tool (Torx socket set). Oh, and since I still act like a child, I made a fort out of the box. I emerged from my cardboard fort, coffee in hand and began the installation process by removing my spare tire. Once off, I disconnected my stock back up camera and unbolted the spare time mount. 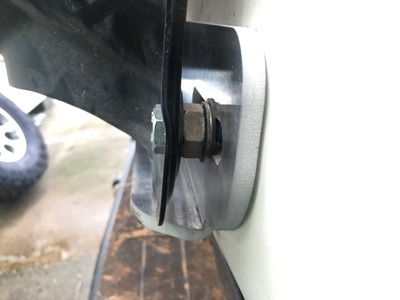 From what I am told, the early year model FJ's have four bolts holding the mount on, the newer year models (mine) have two top nuts and two bottom bolts. 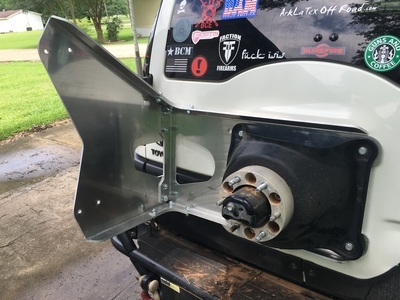 After removing the spare tire mount, I decided to leave the top studs in place to make installation of the FJ PAX Mount and spare tire mount easier. My thought process was, by leaving the studs on and using them as a mounting point, I could get everything in place and lined up without having to hold it all together and thread the new bolts in. I decided the second option was best for me. I think I have only used the rear wiper twice and both times were on accident so removing it was not that big of an issue. Removing it is very simple. 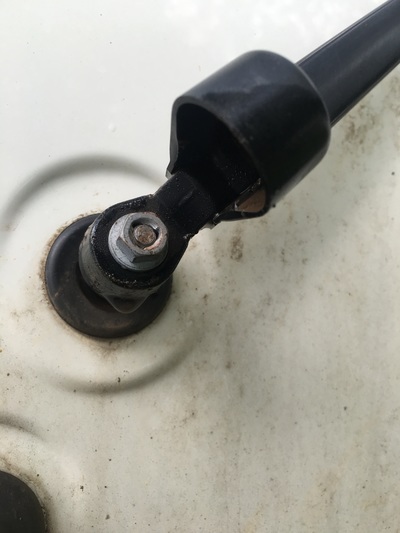 Lift up on the cap at the base of the wiper arm and use a 10mm socket to remove the nut. Once the nut is off, give it a gentle tug and you're good to go. Next, I began installation of the FJ PAX Mount, starting with the rear plate. 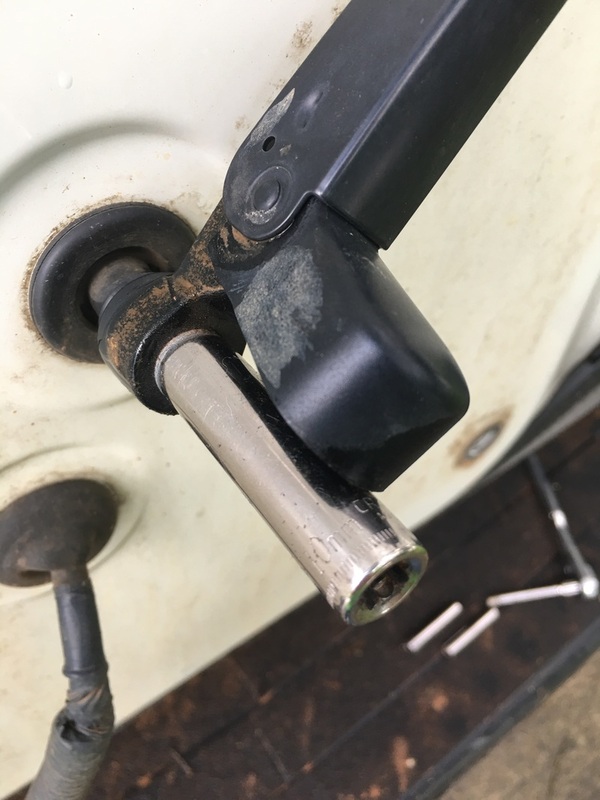 Once I had that in place, I used the bolts that came with the kit and loosely bolted the bottom bolts to help hold it in place. I then removed the top studs using a E10 Torx socket and inserted the replacement bolts. 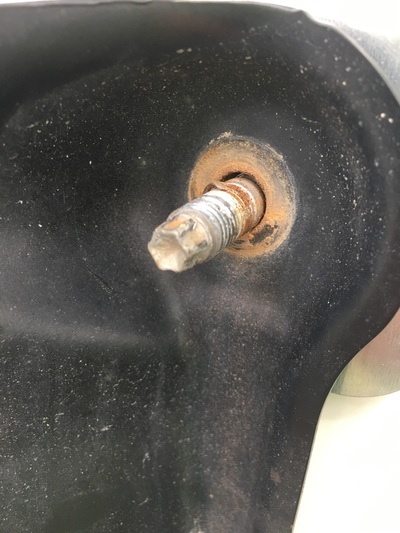 Note: removing the top studs is not necessary, if you do not have a Torx socket or do not feel like removing them, installation can still be completed with out the replacement bolts. From there, I mounted the side plate to the base plate. 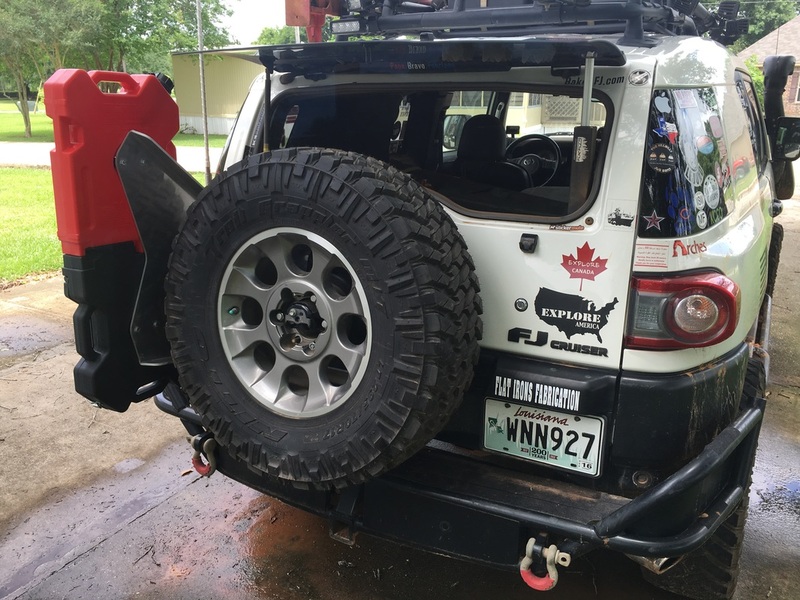 After that, I did a test fit of the spare tire. 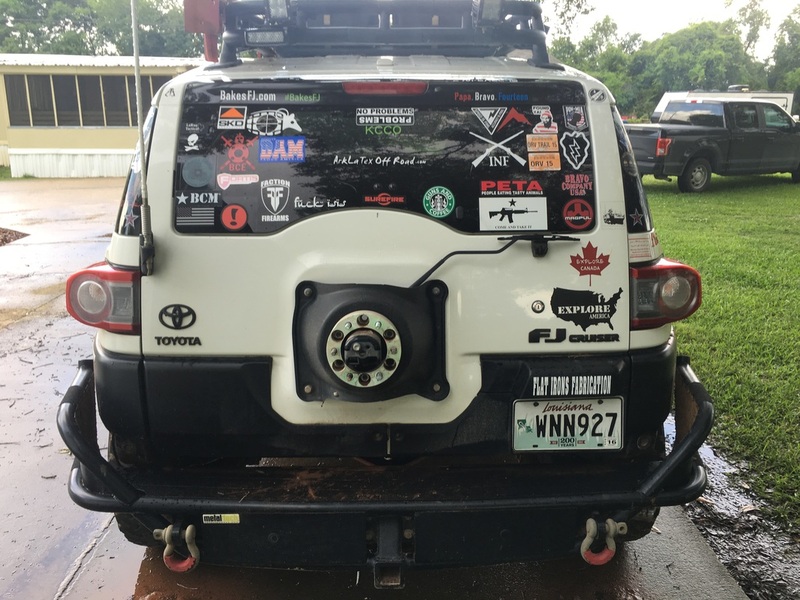 I wanted make sure the spare tire would clear my rear bumper and also to make sure I had proper space between the side plate of the FJ PAX Mount and the spare tire. 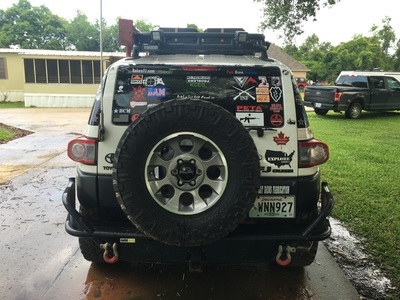 Because I'm running a larger tire and have a after market rear bumper (Metal Tech tube bumper) I used a 2" spacer on the spare tire mount and used a nut and washers to space the spare tire mount away from the rear door to prevent the spare tire from hitting the bumper. 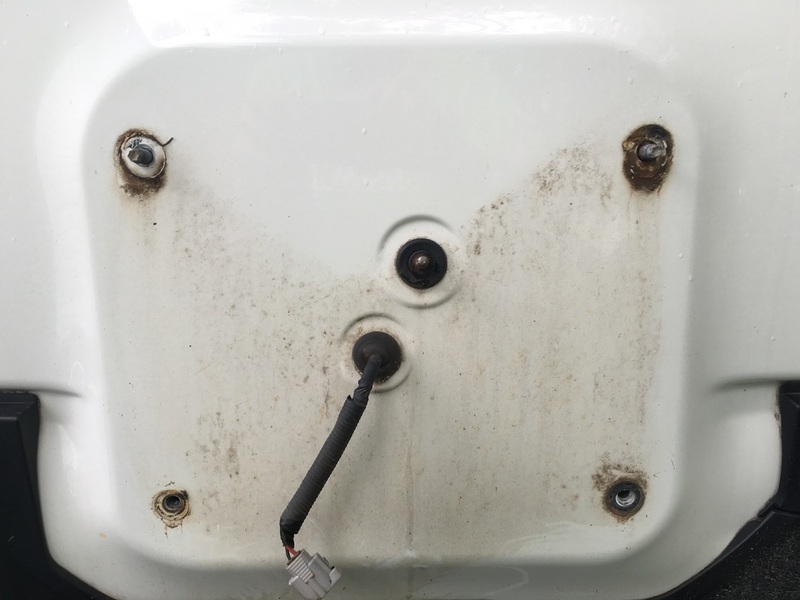 This was an issue I had before installation of the FJ PAX Mount. 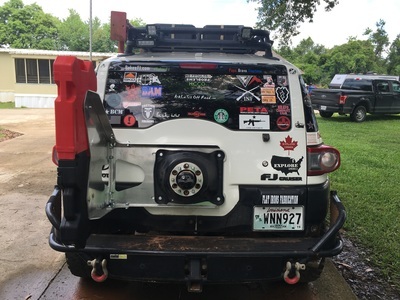 I still need to use a nut and washers to create distance between the mount and rear door to allow the spare tire to fit. After a brief coffee break, I got the Rotopax mounts, mounted to the side plate. From there I did a test fit and checked to make sure every thing worked properly. The only issue I found, was when I have the Rotopax cans mounted and open the rear door, the bottom can makes contact with the top kick out of the rear bumper on the drivers side, preventing the door from opening all the way. This is not a big deal to me though. 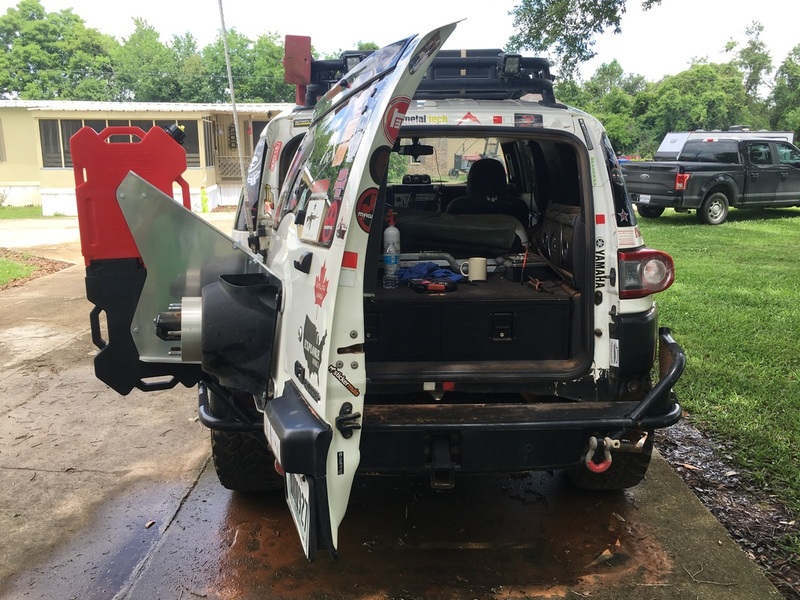 If I need the rear door open all the way, I'll remove the bottom Rotopax can and I'll be good to go. Because the FJ PAX Mount is so easy to use, this might add a few extra seconds when I had to load or unload something where I need the rear door open all the way. I quickly got the Rotopax mounts, mounted to the side plate. From there I did a test fit and checked to make sure every worked properly. The only issue I found, was when I have the Rotopax cans mounted and open the rear door, the bottom can makes contact with the top kick out of the rear bumper on the drivers side, preventing the door from opening all the way. The final step, mount the spare tire back on the carrier! I am very happy with the look, fit and functionality of the FJ PAX Mount. Obviously, one big concern with this kit, is the weight being added to the rear door. A gallon of gas weighs approximately 6 pounds and a gallon of water weighs approximately 8 pounds. 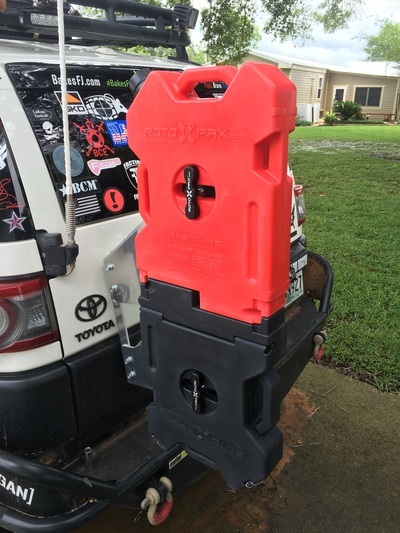 Depending on what type of adventure I take and where I go, I'm guessing I'll run three Rotopax fuel cans and one Rotopax water can (approximately 52 pounds) or four Rotopax fuel cans (approximately 48 pounds). I estimate with full cans, mount and spare tire, I'll have about 165 pounds on the rear door. Having said that, the weight is not a big issue to me. I just be a little more causes when opening/closing the rear door. Also, I will not always have that much weight back there. When I'm home, I'll run my Rotopax cans empty or have a minimal amount of fuel in them. To me, the extra weight of this set up is worth it. 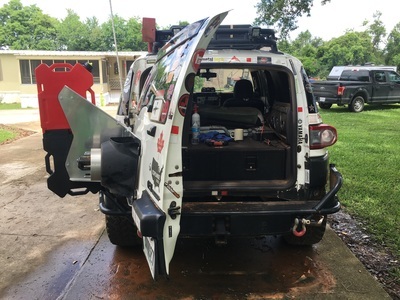 I can still open and close my rear window using the power window kit and I have extra fuel really available when I need it without all the hassle of my old set up.